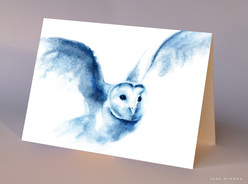 Tara Winona art prints and greeting cards can be supplied wholesale. Prints are also available as retail sale or return. Please contact us for details. Tara Winona cards are printed onto high quality 300gsm textured artcard, individually wrapped and packaged with recycled paper envelopes. Cards measure 120 x 170 mm (6½ x 4½). Paper stock is FSC accredited.